Archbishop Ryan sophomore Sidiki Fofana is fighting frustration. The Archbishop Ryan boys' soccer team was down, 4-0, against Penn Charter recently, and the game seemed out of reach with 10 minutes left. Still, Ryan sophomore striker Sidiki Fofana was asking his coach if the starters were going back in. The look on Fofana's face during the second half of the 5-0 loss said it all. "Losing is always frustrating," Fofana said. In the Raiders' first four wins this season, Fofana scored nine goals. In their first five losses, he scored none. "I've been shut out four games in a row," Fofana said before he scored two goals in a 3-2 win over Springside Chestnut Hill on Saturday. Teams "are putting four guys on me now. Sometimes it gets frustrating." Fofana takes his soccer seriously and wants to win all the time, but the Raiders — 5-5 through their first 10 games — are trying to find their footing this season. Fofana (7) and his teammates watch from the bench as the game against Penn Charter winds down. 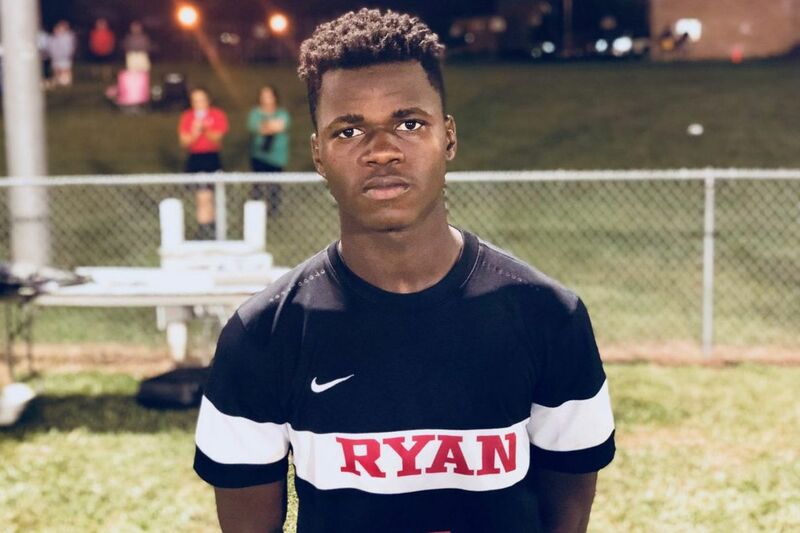 Since transferring from Northeast in January — after leading the Public League with 16 goals in nine games as a freshman — Fofana has been sensational for a young Ryan team that starts eight underclassmen and only three seniors. "He started so hot for us, with nine goals in five games. Now coaches are preparing for him," Ryan coach Ryan Haney said. "His presence around the goal is unbelievable." Haney and Fofana are building a relationship in their first season together, and Fofana said he wants to be pushed. He speaks with great admiration for his coach. "Coming here, being new, Coach has been one of my biggest inspirations this year," Fofana said. "He's pushing me to be a leader as a sophomore. I hope I can live up to his expectations"
Fofana (right) and his disappointed Archbishop Ryan teammates walk off the field after losing to Penn Charter. Haney, who played soccer at Temple University, said he knows improvements are still to be made if Fofana wants to reach his potential. "He's going to have to be able to handle being marked, handle having two or three guys on him at times and create not only opportunities for himself but for his team," Haney said. Fofana and his family came to America from Liberia 2011 after a second civil war there. He said his parents wanted a better life for their family. He said he doesn't know what his future holds, but helping his family succeed is his main goal. "I want to go pro one day," Fofana said. "I think playing at the highest level possible can help me and my family." In the meantime, being a leader for this young Ryan team seems to be something that Fofana embraces. His confidence remains high despite his recent scoring slump, and the coaches obviously have great trust in him. He said he knows there is room for improvement, and he is already talking about winning the Catholic League championship — maybe this year. What would winning that title mean to Fofana? "Soccer is everything, man," he said. "Without soccer, there's nothing."